On October 9, at the Government House of the republic, Tatarstan President Rustam Minnikhanov held a meeting with prize-winners of EuroSkills-2018 Championship. Deputy Prime Minister - Chief of Staff of the Cabinet of Ministers of the republic Shamil Gafarov, Deputy Chief of Staff of the Cabinet of Ministers of the republic Aleksandr Terentiev, Deputy Prime Minister –Tatarstan Minister of Education and Science Rafis Burganov, experts and parents of Tatarstan sportsmen took part in the meeting. At the end of September, for the first time, the Russian team won the first place in the medal table of the EuroSkills-2018 Championship in Budapest. The national team included six representatives from Tatarstan, who won three gold medals in CAD Engineering Design competence, Entrepreneurship and Mobile Robotics and a silver medal in Carpentry competence. Minnikhanov congratulated the young professionals and noted their significant contribution to the victory of the Russian team. 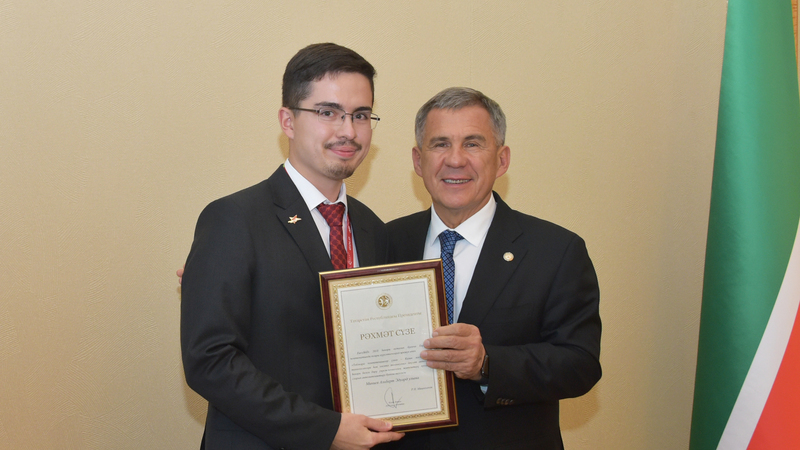 “You have proved your superiority at the European level,” Tatarstan President emphasized. He added that the participants of the Championship have gained enormous experience, which will be useful in their future career. “You have great future. The specialties included in the WorldSkills list are very popular. Your skills are your main competitive advantage,” he said. At the end of the meeting, the ceremony of awarding of EuroSkills-2018 prize-winners and their mentors took place.